Payroll tax filing and properly executing your end-of-year payroll obligations is often a process fraught with potential mistakes and missed deadlines. Full and part-time employees already require a great deal of compliance for employers. But engaging independent contractors adds another level of complexity. The IRS requires that, when filing payroll taxes, you inform them when you have hired anyone who has received taxable payments from your during the year. This is done by filing an IRS Form 1099-MISC, an information return for advising the IRS and other government agencies. The 1099-MISC serves as one of the main tools for preventing self-employed individuals from under-reporting their taxable income. In addition, the IRS can also impose penalties on a hiring firm if they intentionally fail to file a Form 1099 when required. However, while you might not fail to do so intentionally, it's not worth the risk of accidentally failing to file for every contractor you paid when doing your payroll tax filing. According to the IRS, the basic rule is that you must file a 1099-MISC for any independent contractor who is a sole proprietor, or member of a partnership or LLC who has received $600 or more in the year for work done in the course of your trade or business. A trade or business is an activity carried on for gain or profit. Generally you are not required to file a 100-MISC for payments to a corporation including a LLC that is treated as a C- or S-Corporation. However, because the rules vary depending on the type of vendor or recipient it is critical to familiarize yourself with the IRS instructions. When completing your payroll tax filing, you are not required to file a 1099-MISC for payments for any non-business related services. Examples of these types of payments would be those you made to housekeepers, babysitters, dog-walkers, or even home landscape services. Form 1099-MISC is a multi-part form. It is comprised of a Copy A, Copy 1, Copy B, Copy 2, and Copy C. You cannot simply photocopy the form from the IRS website or PDF. You need to have an original copy, because it is a multi-part form. 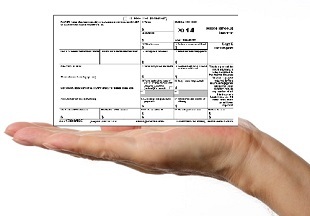 These can be easily obtained from the IRS or from your local office supply store. If needed, you can request a 30-day extension on the time for filing your 1099s by filing IRS Form 8809, Extension of Time to File Information Returns. This form must be filed with the IRS by February 28. Keep in mind that this extension is not automatic and you are required to provide an explanation for requesting it. You will receive a letter of explanation from the IRS either approving or denying your request. When doing their payroll tax filing, many businesses today file their 1099s electronically and, in fact, if you are filing 250 or more information returns, you must file electronically with the IRS. Paperless filing can be done with most accounting software and there are several websites that also offer electronic filing services for 1099s. Another great option is to use a payroll tax service, such as Accuchex, to file them for you. Keep in mind, however, that independent contractors must be provided with a paper copy of the 1099-MISC unless they agree to accept an electronic version. It cannot be emphasized enough how critical it is for businesses to stay abreast of the myriad of IRS and other government agency compliance rules and regulations. The potential cost to businesses that fail to meet deadlines or miss filing certain forms altogether can be devastating, especially to smaller businesses. Payroll tax filing is a business necessity, but it needn't be a such a costly burden. Considering a reliable payroll management services provider like Accuchex can be an investment that not only can save your company money in staffing and regulatory costs, but can bring you a peace of mind that is priceless!